Astronaut Virgil I. Grissom climbs into "Liberty Bell 7" spacecraft the morning of July 21, 1961. 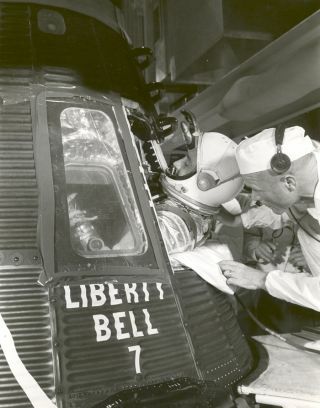 In this historical photo from the U.S. space agency, Astronaut Virgil I. Grissom climbs into "Liberty Bell 7" spacecraft the morning of July 21, 1961. Backup Astronaut John Glenn assists in the operation. The Mercury-Redstone 4 (MR-4) successfully launched the Liberty Bell 7 at 7:20 am EST on July 21, 1961. MR-4 was the second in a series of successful U.S. manned suborbital flights.